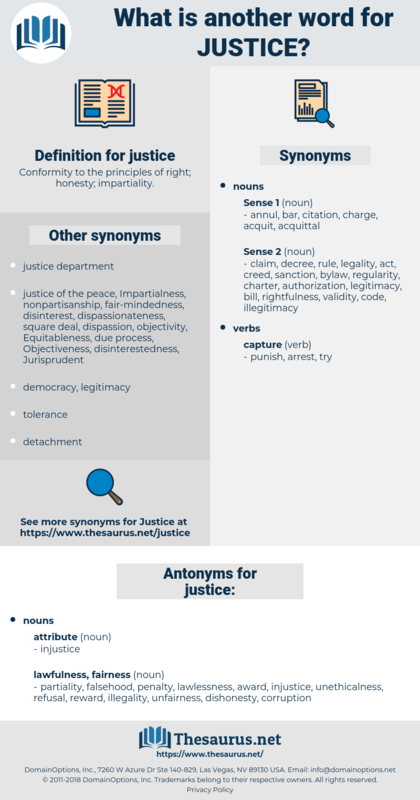 What is another word for justice? Conformity to the principles of right; honesty; impartiality. representatives, Resources, statutes, contributions, Addresses, priorities, supplies, regions, sexes, programmes, Habits, Programs. Lawyers, judicial, auditors, judge, judiciary, fairness, judges, court, courts, judicature. 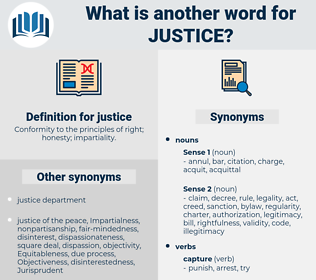 judicial, injustice, judge, judiciary, fairness, jurisprudence, justness, court, righteous, litigation, adjudication, judicature. dishonesty, award, falsehood, lawlessness, unethicalness, partiality, reward, unfairness, penalty, refusal, corruption, illegality. nepotism, prejudice, harm, preconception, untruth, subjectivity, unlawfulness, tendency, wrongfulness, prejudgment, crime, bent, leaning, propensity, unreasonableness, offense, subjectiveness, partisanship, favor, chauvinism, predisposition, predilection, one-sidedness, wrongdoing, favoritism, bias, wrong, proclivity, inclination, nonobjectivity, penchant. And so we shall never have justice, - simply because there is none! I do her perfect justice.